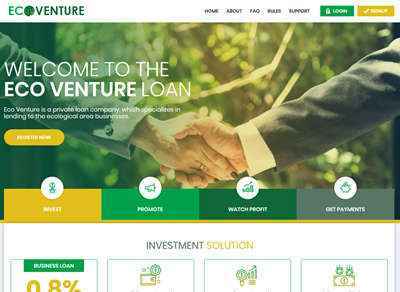 Eco Venture - это частная кредитная компания, которая специализируется на кредитовании предприятий экологического направления. Наша программа предназначена для людей, желающих достичь своей финансовой свободы, но не в состоянии сделать это, потому что они не являются финансовыми экспертами. Прибыль от этих инвестиций используется для улучшения нашей программы и повышения ее стабильности в долгосрочной перспективе. 02.03.19 14:38 Transfer Sent Payment: 60.00 USD to account U18977213 from U1294xxx. Batch: 249006153. Memo: Shopping Cart Payment. Deposit to Eco Venture User allhyips. Ого, доложить какой, аж с августа прошлого года тихо работает. Ну посмотрим, наверно, за все время куча игроков тут играет. На ISP проверил, да, действительно, 6 мес показывает, 4 тыс $ вкладов, все с хайпклaба. Последний раз редактировалось Smirnov Nikolay; 03.03.2019 в 00:30. 03.03.19 17:47;Account;Receive;Received Payment 0.3 USD from account U18977213 to account U1294000. Batch: 249154374. Memo: API Payment. Withdraw to allhyips from Eco Venture. 04.03.19 18:39;Account;Receive;Received Payment 0.3 USD from account U18977213 to account U1294000. Batch: 249309327. Memo: API Payment. Withdraw to allhyips from Eco Venture. 06.03.19 07:00;Account;Receive;Received Payment 0.3 USD from account U18977213 to account U1294000. Batch: 249520252. Memo: API Payment. Withdraw to allhyips from Eco Venture. 07.03.19 02:10;Account;Receive;Received Payment 0.3 USD from account U18977213 to account U1294989. Batch: 249648700. Memo: API Payment. Withdraw to allhyips from Eco Venture. 07.03.19 15:19;Account;Receive;Received Payment 0.3 USD from account U18977213 to account U1294000. Batch: 249735860. Memo: API Payment. Withdraw to allhyips from Eco Venture. 08.03.19 20:47;Account;Receive;Received Payment 0.3 USD from account U18977213 to account U1294000. Batch: 249917364. Memo: API Payment. Withdraw to allhyips from Eco Venture. Мне понравился проект ,долго работает , пусть так и продолжает . 10.03.19 00:16;Account;Receive;Received Payment 0.8 USD from account U18977213 to account U1294000. Batch: 250056720. Memo: API Payment. Withdraw to allhyips from Eco Venture. 10.03.19 14:42;Account;Receive;Received Payment 0.3 USD from account U18977213 to account U1294000. Batch: 250131864. Memo: API Payment. Withdraw to allhyips from Eco Venture. 11.03.19 23:59;Account;Receive;Received Payment 0.3 USD from account U18977213 to account U1294000. Batch: 250340336. Memo: API Payment. Withdraw to allhyips from Eco Venture. 12.03.19 15:31;Account;Receive;Received Payment 0.3 USD from account U18977213 to account U1294000. Batch: 250457729. Memo: API Payment. Withdraw to allhyips from Eco Venture. 13.03.19 19:57;Account;Receive;Received Payment 0.3 USD from account U18977213 to account U1294000. Batch: 250663103. Memo: API Payment. Withdraw to allhyips from Eco Venture. 14.03.19 19:21;Account;Receive;Received Payment 0.3 USD from account U18977213 to account U1294000. Batch: 250833834. Memo: API Payment. Withdraw to allhyips from Eco Venture. 15.03.19 18:38;Account;Receive;Received Payment 0.3 USD from account U18977213 to account U1294000. Batch: 251001194. Memo: API Payment. Withdraw to allhyips from Eco Venture. 17.03.19 02:32;Account;Receive;Received Payment 0.3 USD from account U18977213 to account U1294000. Batch: 251193245. Memo: API Payment. Withdraw to allhyips from Eco Venture. 17.03.19 18:44;Account;Receive;Received Payment 0.3 USD from account U18977213 to account U1294000. Batch: 251318241. Memo: API Payment. Withdraw to allhyips from Eco Venture. 19.03.19 04:35;Account;Receive;Received Payment 0.8 USD from account U18977213 to account U1294000. Batch: 251550178. Memo: API Payment. Withdraw to allhyips from Eco Venture. 20.03.19 04:29;Account;Receive;Received Payment 0.3 USD from account U18977213 to account U1294000. Batch: 251726185. Memo: API Payment. Withdraw to allhyips from Eco Venture. 21.03.19 04:42;Account;Receive;Received Payment 0.3 USD from account U18977213 to account U1294000. Batch: 251897702. Memo: API Payment. Withdraw to allhyips from Eco Venture. Как поменять имя пользователя (nickname)?